Earn points and improve the skills of your character. Level Up 1.7.2 and 1.7.10 is a mod that adds the term “skills” to the game. These skills will be improving getting skill points. You will get this points when you gain experience, exactly get 3 skill points per level of experience you win. 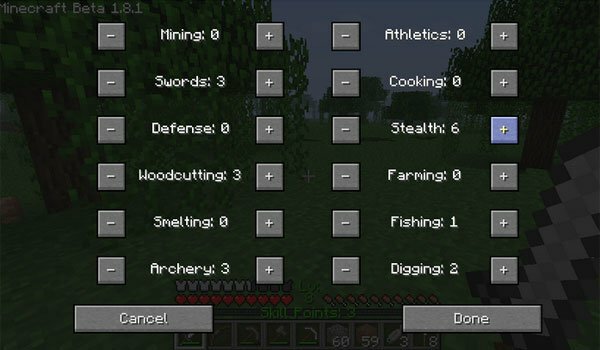 To access the menu of skills within the game have get in the deafult Minecraft menu and you will find a new button called “Allocate Skill Points”. Select that, and all the skills that you can develop will be shown. How to install Level Up Mod for Minecraft 1.7.2 and 1.7.10? Adds new levels and improve your skills!